Over the past two days, perhaps you’ve noticed an increase in pastel pink and blue across your social media feeds, in the daily news, and even lighting up San Francisco’s City Hall. On Wednesday, President Trump tweeted that transgender people cannot “serve in any capacity in the U.S. Military” (although, as of this writing, the military has confirmed that the current policy allowing transgender individuals to serve remains in place). In response, people have shown their support for the transgender community using the transgender pride flag, designed by transgender activist and U.S. Navy veteran Monica Helms in 1999. The story behind Helms’s activism and how she created this symbol for the transgender community is a poignant example of the role design can play in the ongoing fight for transgender rights. Helms joined the Navy after high school, serving in the engine room of two submarines from 1970 to 1978. According to an essay she wrote in 2009, she started cross-dressing four years into her service but kept it secret for fear of being kicked out. “It was the deepest, darkest secret in my entire life,” she wrote. “I would tell someone that I’d murdered someone before I’d tell someone I cross-dressed.” After being transferred to the Bay Area in 1976, she found an LGBT community and started to come out to more people in public, though not within the military. In 1987, she writes, she came out as transsexual and in 1992 began to transition. Helms’s flag emulates the broad stripes and alternating colors of the LGBT Rainbow Flag, but alternates light pink and light blue—the traditional color for baby boys and girls, in Helms’s words—with a white middle stripe for those who are intersex, transitioning, or consider themselves to have a neutral or undefined gender. The unadorned design is such that “no matter which way you fly it, it is always correct, signifying us finding correctness in our lives,” as Helm has explained. After Helms created the flag, she started taking it with her to pride parades and marching in the color guard with it. By 2013, she was seeing it everywhere–at pride parades, in other countries, flying in San Francisco’s Castro District for Transgender Day of Remembrance. At the ceremony celebrating the museum’s acquisition of the flag, Helms took the opportunity to call for the Department of Defense to accept the service of openly transgender people. “Since the Smithsonian will be displaying items from my military career, they are also acknowledging that we have contributed to the security of our country since the Revolutionary War,” she said of the museum. While it is the best-known, Helms’s flag is not the only one to represent the transgender community. There’s the Black Trans Flag, a variation of the Transgender Pride Flag that replaces the central white stripe with a black one to represent the black trans community. 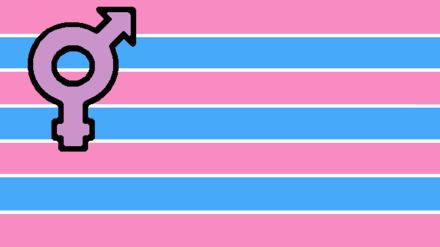 Others, like the Israeli transgender and genderqueer flag and Johnathan Andrew’s Transgender Pride Flag, designed in the same year as Helms’s, feature a twinned Mars and Venus symbol. As Helms suggests with the design of her flag, there’s no wrong way to show your pride and support of the transgender community. Pick your flag, because now is the time to fly it.